Former England captain Terry Butcher says Wayne Rooney will be very lucky if he escapes with a one-match ban after his red card in Montenegro. He was sent off for kicking Miodrag Dzudovic in Friday's 2-2, which confirmed England's qualification. "If he gets one game he's the luckiest man in the world," said Butcher. "He's got no defence and he just has to hope Uefa are lenient. He has had red cards before and Uefa may see it as a chance to make their mark. "I would expect at least a two-game ban. He's got previous form and Uefa will look at this and I think they will say you just can't do it." Rooney and England coach Fabio Capello have written to Uefa in the hope of limiting potential punishment, which could be extended to three matches. And referee Wolfgang Stark has said the striker's lack of dissent after the decision may help his cause. But Butcher told BBC Sport: "The referee said he did not contest the red card and that might count in his favour. "But it is surely not the reaction he gave to the decision but the action that Uefa will judge. It was idiotic and quite aggressive towards his opponent. "For me it showed a complete lack of respect for his team-mates and England. "Capello must be so frustrated. How could he have seen that sort of behaviour coming? You couldn't condone what Rooney did at seven or eight-year-old level." Butcher also fears the impact Rooney's absence will have on England's Euro 2012 ambitions if the suspension is stretches beyond the first game of the tournament in Poland and Ukraine. "If Rooney is out of England's team it is a massive blow," said Butcher, who won 77 caps in a 10-year international career. "And it puts lots of pressure on the other players because England look nowhere near a top team without him. "He is critical to England's plans. He is the Lionel Messi of England's team. England are so reliant on one man. No-one else fills the role he does and does it with such quality. 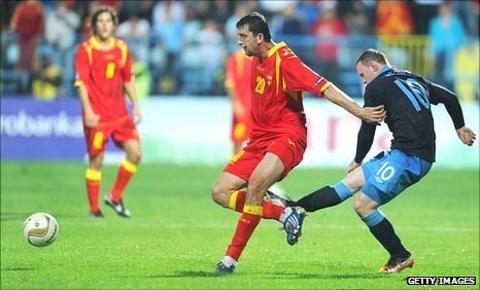 "Rooney will regret what he did for a long time and England will hope they are not left to regret it at Euro 2012. It is not only marvellous deeds that make a player's reputation, it is mistakes like this that blight a career."